Whenever installing a GFCI outlet receptacle on a 20 amp breaker, what should be used, a 20 amp GFCI, or is a 15 amp GFCI OK too? The rules that apply to installation of a GFCI outlet receptacle on a 15 or / and 20 amp rated circuit breaker are the same as the ones that apply to a regular outlet receptacle. Additionally, there may be some regulations applicable only to a particular area this GFCI is going to be installed, or your local jurisdiction requirements. The wires (electrical conductors) between the 20 amp rated circuit breaker and this GFCI outlet receptacle (or any outlet receptacle) must be at least 20 amp rated (gauge 12). It doesn’t matter if the end device is 15 or 20 amps rated. 15 amps outlet receptacles are rated for 20 amps feed-through. In other words, they supposed to withstand the loads of a 20A rated device. The following is based on the 2008 NEC (National Electrical Code) Edition. Article 210.21 states that the amperage rating of outlet devices shall not be less than the load to be served by those outlets. Item (1) under 210.21 (B) Receptacles applies to a Single Receptacle on an Individual Branch Circuit. If you have a single outlet receptacle (regular or GFCI) installed on an individual branch circuit (a circuit breaker protecting only this one outlet receptacle), this outlet must have the same rating as the circuit rating. An Example: the bathroom requires a 20A rated branch circuit. If this bathroom has only one electrical outlet receptacle installed, it must be 20A rated as well. There are two exceptions in this paragraph that concern motor controllers and arc welders – let me know if you need more information about it. Item (2) from the same paragraph refers to 2 or more outlet receptacles supplied by a single branch circuit / protected by a single circuit breaker. Total Cord-and-Plug-Connected Load. Where connected to a branch circuit supplying two or more receptacles or outlets, a receptacle shall not supply a total cord and-plug-connected load in excess of the maximum specified in Table 210.21(B)(2). 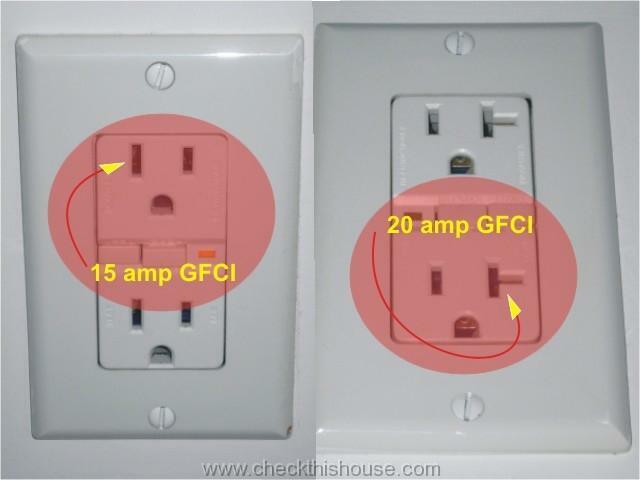 Based on that table, two or more 15 amp rated GFCI outlet receptacles can be installed on a 20 amp rated circuit breaker if the load of the devices connected to each one of those outlet receptacles is less than 12 amps (80% of its rating). Let’s apply that to a bathroom; theoretically, you could have two or more15 amps rated GFCI outlets installed / supplied by a 20A, single branch circuit. However, your local jurisdiction might require those receptacles to be 20 amps rated instead. 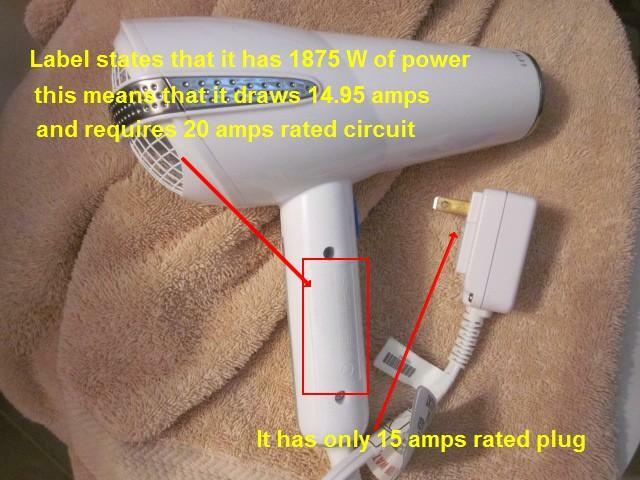 This is because some of the devices (1875Watts hair dryer for example) you may want to plug into those 15 amp rated outlets draw more that the maximum permitted 12 amps. 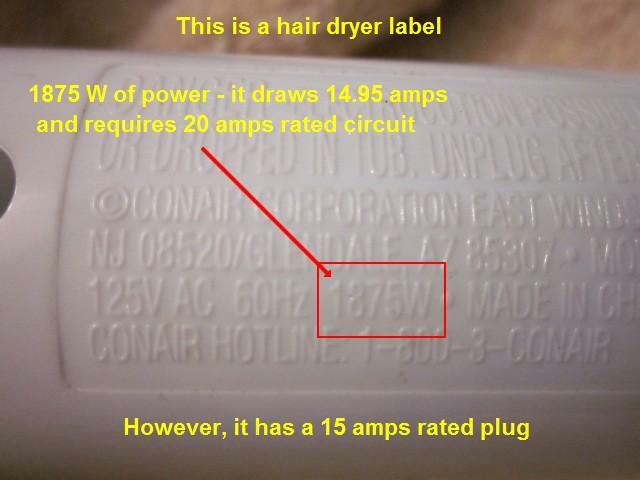 Shouldn’t those more powerful hair dryers have a plug designed for a 20 amp rated outlet receptacle? I think they should. The same applies to the kitchen outlets, laundry room and other areas that require a 20 amps rated branch circuit – check with your local building department. Also, you’ll find devices / appliances that are equipped with a 20 amp rated / type cord and plug. Remember, those cannot be plugged into a 15 amp rated outlet receptacle (the plug will not fit), so consider that before outlet installation. Item (3) from the Article 210.21 covers receptacle ratings for various size circuits – shown in the Table below. What that means is that you should not install an outlet receptacle rated higher than the branch circuit it is attached to. protected by a 15A circuit breaker.